Without a doubt, Bansko is famous among tourists basically as a skiing and a snowboarding destination. The total length of the ski tracks is 75 km, as the longest of them is 16 km long. About 90% of all 16 tracks are equipped with canons for artificial snow for high-quality and long-lasting snow cover. There is also a track equipped with lights for night skiing in the region. An open-air ice skating ring works in the town during the winter season. The highest point of the ski center is 2560. The greatest challenge for the skiers in Bansko is the track Tomba, named after the Italian skier Alberto Tomba. A cabin lift is available for the tourists. It takes them from the starting point of the ski lift station in the town of Bansko to Banderishka Polyana. The town is connected with the ski zone and with a 7 km long ski road. There are multiple museums and landmarks in the town. 130 architectural and historical monuments of culture are registered, seven of which are of national significance. There are several legends about who founded Bansko. According to one of them, Bansko was founded by people who lived in Dobarsko, a village in Rila, itself according to a legend founded by the blinded army of Tsar Samuil. Another legend claims that Bansko was founded by an Italian painter by the name of Ciociolino, hence the existence of the name Chucholin in Bansko. Still according to another version it was a Slavic tribe called the Peruns, who lived in Pirin and worshiped Perun, that founded the village later to become a town. There are a number of ethnographic texts, legends, prayers and oratories, which lend credence to this legend. 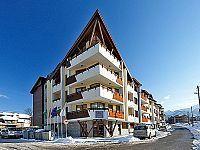 The strategic location of Lazur Family hotel in Bansko, being just a 5 minute walk away form the Gondola ski lift and within small walking distance to Bansko ski center, makes Lazur Family hotel a top choice among Bansko hotels. 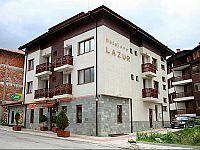 Lazur family hotel in Bansko town is an ideal choice for guests who wish to experience pure Bulgarian hospitality, as the hotel is family run and also because of its traditional restaurant(mehana) as well, where local Bulgarian specialities are served. Lazur Family Hotel in Bansko is open throughout the whole year and during the summer frequent barbeque nights take place in the hotel's garden, where guests can experience a truly Bulgarian hospitality, among Bansko hotels! Elegant Spa Hotel hotel in Bansko is strategically located among Bansko hotels, just a 2 minute walk away from Gondola ski lift and a 7 minute walk away from Bansko old town, offering stylish apartments with kichenette and spectacular view towards Pirin mountain and Bansko ski center. The excellent spa and recreational area of Elegant Spa hotel in Bansko, ensures for total relaxation to all hotel guests, who can experience a luxurious and fully equipped spa centre with recreational area that offers aromatherapy, massage therapies, wellness therapies, cosmetic studio, indoor swimming pool, sauna, jacuzzi, steam bath and fitness center, for a unique accommodation in Bansko. All hotel rooms of Elegant Chalet hotel in Bansko provide hotel guests with balcony and beautiful view of the mountainous landscapes of Bansko and furthermore they contain a fully equipped kitchen for self catering service. The hotel reception operates 24 hours a day and there is a free ski storage space for all hotel guests and moreover, Elegant Chalet hotel in Bansko provides with free use of sauna jacuzzi and fitness center, for a relaxing accommodation in Bansko. Elegant Chalet in Bansko offers to hotel guests free wireless internet access throughout the whole hotel property, a restaurant with Bulgarian and international dishes, as well as a supreme location among Bansko hotels! Traditionally built with modern interior design and rooms with balcony overlooking the mountains and Bansko ski center, Vikoni Family Hotel in Bansko town, offers clean and cosy rooms at truly competitive rates among Bansko hotels. Delicious dishes are daily served at the hotel's folk style restaurant (mehana), varying from regional to european recipies, in a relaxing and homely ambience right next to the hotel's fireplace, ideally after a long day on Bansko ski center ski slopes. 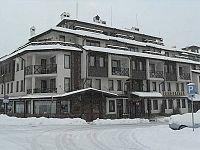 Vikoni Family Hotel offers to all hotel's guests a very hospitable enviroment at a peaceful location near Bansko town center and just 800 meters away from Gondola ski lift, which is further enhanced by the free shuttle service provided towards Gondola ski lift, for a unique accommodation in Bansko! Centrally located in Bansko Town, next to Glazne river and within walking distance from the gondola ski lift, Banderitsa Hotel & Spa offers stunning views of mountain Pirin and the ski slopes of Bansko ski cente, for a wonderful and relaxing accommodation in Bansko. Banderitsa Hotel outlets, such as the irish pub and the cafe-restaurant, add relaxing moments to guests' accommodation in Bansko and the opportunity to try tasteful local specialities and drinks. Starting the day in Banderitsa Hotel & Spa, with a rich buffet breakfast and a free shuttle service to gondola ski lift, guarantees for good stamina on the ski slopes of Bansko ski center and for a superb holiday, among Bansko hotels! Kralev Dvor hotel in Bansko town, is named on one of the most beautiful peaks of mountain Pirin and is one of the most charming family hotels in Bansko, having been awarded with the best family hotel prize, by the mayor of Bansko town in 2009. Conveniently located in quiet road of Bansko town center, Kralev Dvor hotel is ideally based among Bansko hotels, for visiting the historical center and Gondola ski lift within 15 minutes walk, however there is a shuttle service to Gondola ski lift provided as well. 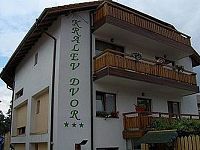 Kralev Dvor hotel in Bansko town, is an ideal hotel establishment for relaxation and accommodation in comfort, providing with spacious, shiny clean rooms and warm hospitality from the hosts to all hotel guests. 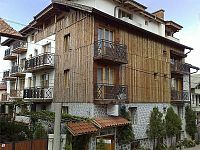 Kralev Dvor hotel in Bansko Town, has been certified with a "Green House" diploma, for using economically water and energetic recources , recycling the garbage , supporting actions for saving the nature and is active representative of the regional culture and regional food products, provided to all of its hotel guests in Bansko town! Grand Hotel Bansko is a luxurious hotel complex located in Bansko ski resort, offering 2 large indoor and outdoor swimming pools, a fully equipped spa and wellness area with gym and a casino as well. Furthermore, Grand Hotel in Bansko is distinguished among Bansko hotels, for its vibrant amusement, as it provides with a lobby bar, a pool bar, a night bar, a night club with frequent live shows and a casino with classic roulette tables. 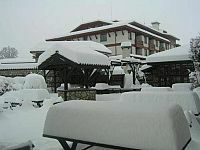 Staro Bansko is the hotel's traditional Bulgarian restaurant offering a cosy, local atmosphere. 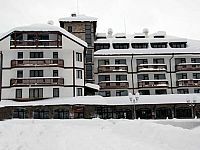 The Grand Hotel Bansko complex offers a great variety of services, including transfers to the ski centre of Bansko and the village of Dobrinishte, ski rental, ski instructors and mountain guides. 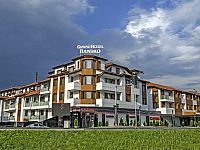 Grand Hotel in Bansko is a top choice for accommodation in Banski ski resort, Bulgaria as it offers exceptional high class services at value for money rates. Overlooking the gorgeous mountain of Pirin and the ski slopes of Bansko ski center, all rooms of Bisser Family Hotel in Bansko are neat and cozy containing all necessary facilities and amenities, including free wireless internet throughout the hotel. 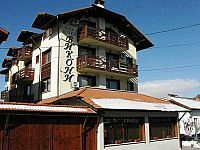 Located between Bansko Town center and the gondola ski lift, makes is it easy to discover the greater area of Bansko Town on foot, moreover guests can use the hotel's regular free shuttle service towards the gondola ski lift, for visiting Bansko ski center. Important facilities such as the free use of the sauna and the hotel's rustic restaurant "mehana" (traditional tavern) offering local and international specialities by the fireplace, is an important added value for choosing Bisser Family Hotel in Bansko, for your accommodation among Bansko hotels! 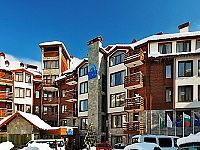 Mountview Lodge hotel in Bansko is centrally located next to Bansko Town center and has a beautiful architecture style which is a blend of alpine with balkan elements, such as the extensive use of wood and stone, with a finish of steep alpine-style roof tops. 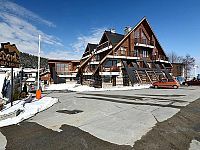 Bansko Town center center and the gondola ski lift, is only a short walk away, making Mountview Lodge hotel a great option among Bansko hotels, providing a central location, important facilities and services, as well as clean and neat rooms for an exceptional accommodation in Bansko Town! Superbly located among Bansko hotels, just a few minute walk away from the Gondola ski lift and Bansko town center, Tanne Hotel in Bansko is open throughout the whole year and offers to guests a cozy ambience for relaxing holidays in discreet luxury. Tanne Hotel in Bansko is a traditionally built chalet style hotel with spacious and clean rooms that provide to guests all necessary facilities and also wonderful views towards the mountainous landscapes, at a very distinguished location among hotels in Bansko. Tanne Hotel in Bansko offers a variety of dining options serving local and international cuisine in the hotel's traditional restaurant (Mehana), furthermore daily cooked breakfast takes place every morning in the hotel's breakfast hall, with a magnificent view towards the mountains. Redenka Lodge hotel in Bansko, is one of the 3 luxurius hotels that are located inside the modern hotel complex Redenka Holiday Club, located approximately 8 km away from Bansko ski resort and 2 km away from Bansko golf course, overlooking the gorgeous Pirin mountains on the south and the Rila mountains on the north. Furthermore, Redenka Lodge hotel in Bansko, offers important services and facilities such as childrens' playground, heated indoor swimming pool, private parking, ski storage room and conference area, making it an ideal choice for accommodation among Bansko hotels. Situated next to the golf course of Bansko, the hotel complex Redenka Holiday Club is a great accommodation choice for golfers, as well as skiers and winter sport fans, who can relax after skiing on Bansko ski center slopes, in the recreational area of Redenka Holiday Club hotel complex, that provides fitness center, wellness/spa center, restaurants and cafe/bars! Grand Montana Hotel in Bansko, offers a great on-site recreational area providing with spa facilities and sports center with swimming pool, making for an ideal option for accommodation among Bansko Hotels. Grand Montana hotel in Bansko, provides to all hotel guests 4-star class services, such the free wi-fi throughout the whole hotel, free ski bus shuttle service towards the gondola ski lift and restaurant with local and international specialties, for a pleasant accommodation in Bansko Town. Grand Montana hotel rooms, provide guests with magnificent views towards the snow-capped peaks of Pirin Mountain and Bansko ski center even from inside their rooms. Grand Montana hotel in Bansko, is ideally situated in the most prestigious and quiet district of Bansko ski resort within walking distance from gondola ski lift and offer to guests mid-upscale facilities, services and welcoming personnel, for a wonderful accommodation among Bansko hotels!